An economic analysis of the overpriced tickets in this country. It’s expected: When a concert organizer announces that a certain artist or group is coming over to the Philippines for a gig, Facebook comes alive! The air is practically buzzing from the excitement of fanboys and fangirls who have been waiting for a long time to see their idols perform live. 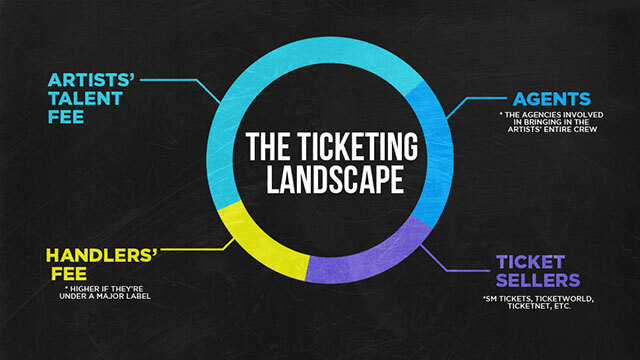 This is usually followed by a post where ticket prices are broken down by section at whatever venue they are playing. The buzz is now accompanied by murmurs of how expensive the show is, and joking offers of whatever body part the fans are willing to sell in efforts to afford tickets that cost an arm and a leg. There are also “wais” suggestions that compare the prices to the same artist’s concerts held abroad and computations are made to determine if it would be more practical to watch the show elsewhere. There are some cases when it actually was cheaper to watch elsewhere, and some concertgoers with ready passports were able to spring for those instead. In a bid to understand why the concerts are more expensive in the Philippines, Esquire reached out to several organizers, who chose to maintain their silence. One insider (bless her soul) willingly gave out the details, after we promised her anonymity. Here, we give her explanations of what goes down into the planning and financing of a concert, to give us a better understanding of what goes behind ticket pricing. Our source says that so many slices are made on that ticket price pie. Fans often don’t see what goes behind the planning and the actual cost that goes into staging a concert. First up is the amount that the organizers have to shoulder to bring the artist to the country. “This includes the airfare, lodging, handling of the equipment, shipping permits, etc.” she explains. It is not just the artist too, because he will want to have his band, back up dancers, road manager, bodyguards, and more. If the organizer does not have a partner venue they will have to book a place to hold the concert. This gives the overall “concert experience,” explains our source. No matter how popular the artist is, no matter how big the fanbase is perceived to be, there is a risk involved. “There is the issue of Piracy vs. Earning from their records. Local and foreign artists get ripped off every day. So, in order to earn, they sometimes raise their talent fee as much as they can. Which is understandable.” She reminds everyone about piracy—every time somebody downloads an album via torrent, copies their album and sells them illegally, that’s being a pirate. Yes, this has happened before, the organizer reveals. Some have even cancelled at the last minute. 3. How the entire production went down. Examples would be if there were problems with the set, or it rained and ruined the band's equipment because it was an outdoor event. There are many other issues that the organizers are held accountable for. 4. Scalping/people buying from scalpers. This is a perennial problem for big concerts, the source says. In Singapore, they already started doing something about it by voiding tickets on the resale market. There is nothing being done here at the moment. Why do some concerts cost much more than the others? “It basically boils down to the demand for the artist. The more famous they are, the higher the ticket prices,” source explains. This doesn’t always apply, though, as she shares that there have been cases where the promoters wouldn't know the artists' worth until they're actually here, especially if it's the artists' first time to perform in the country or there are not enough albums or songs for a concert. She lets some gossip slip: One performer was part of a well-attended roadshow presentation, but the concertgoers know only one of his songs. “The organizers may have an idea, but they're not completely sure how much the concertgoers are willing to pay for a ticket. It's like you're playing a game with your target market. Parang pag nag-RSVP ka sa Facebook event page na 'going,' tapos di ka naman talaga pupunta. Wala namang reliable and 100% accurate gauge ngayon. Mabibigyan ka lang ng idea pero hindi maga-guarantee 'yung success ng concert,” she reveals. 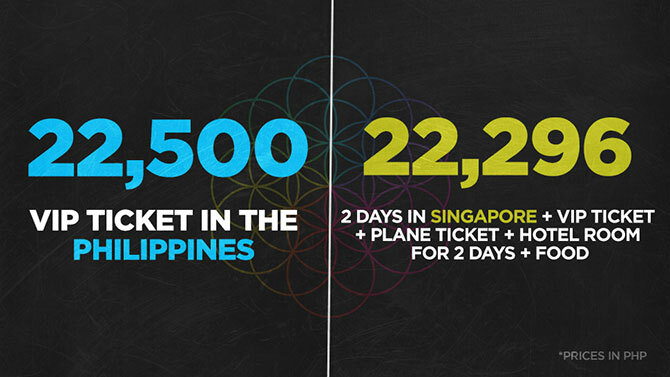 *The computation above is based on two nights in Fragrance Hotel near Singapore's National Stadium, a single ticket (complete with taxes) from an airline's promo, and a SGD10 food allowance per meal from bak kut teh holes-in-the-wall. 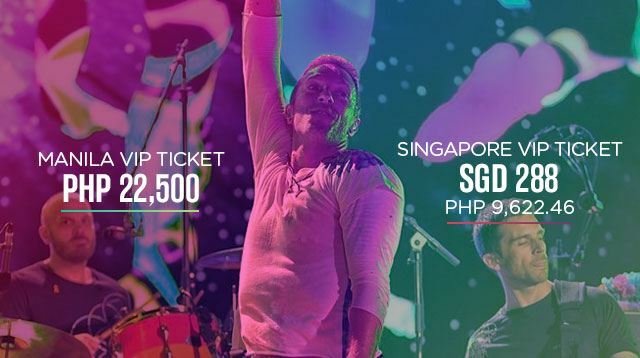 Singapore ticket prices are sourced from Singapore Sports Hub.